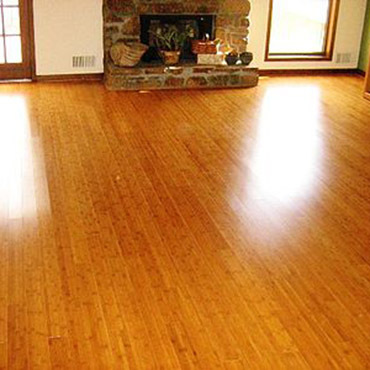 Bamboo flooring is made of bamboo pieces steamed, flattened, bonded together and finished. Bamboo flooring is a very hard wood, especially when seasoned, and it is light and extraordinarily sturdy. Bamboo has been cultivated for more than 4,000 years and is useful as a building material for houses, fences, bridges, pallets, shipping crates, furniture, and even construction scaffolding. Tough is an understatement when you consider these facts. Typically, bamboo has a tensile strength of 28,000 per square inch compared to 23,000 per square inch for steel. Amazingly, bamboo survived the Hiroshima atomic blast closer to ground zero than any other life form. As you can see, bamboo flooring is very hard, strong, and dimensionally stable. With over 500 species, China has the richest bamboo resource in the world in terms of number of species, area and reserve of bamboo, and has long been known as “the bamboo sea”. Nearly all bamboo wood flooring sold in North America is produced in the southern Chinese province of Hunan. China has accelerated its efforts in the protection of natural forests, resulting in a substantial reduction in timber harvest. Consequently, this has created opportunities for the growth of bamboo wood flooring, which is rapidly claiming greater market share. Environmentally, it’s hard to argue with a replacement for hardwood that matures in three to four years, regenerates without need for replanting, and requires minimal fertilization or pesticides. And contrary to beliefs, the harvesting of bamboo is not a threat to Pandas, as they live at much higher elevations and eat a different species of bamboo. Bamboo hardwood flooring is manufactured through more than 20 processing steps. First, by splitting into strips the hollow round shoots. Then, after being boiled to remove the starch, the bamboo strips are dried and bonded into solid boards using urea-formaldehyde (UF) adhesive. These boards are then milled into standard strip flooring construction. The flooring is usually treated with a relatively nontoxic boric acid as a preservative. Bamboo hardwood flooring is an exceptional choice for geographical locations with higher moisture and humidity levels. The dimensional change with moisture content is considerably less than that for most common hardwoods floors. Bamboo floors are divided into natural color boards and carbonized boards depending on the treatment of the bamboo strips. Natural color floors takes on the natural luster of bamboo, while the color of the carbonized flooring, which is treated under high temperature and pressure, is a darker amber and more uniform. The pre-finished products all use UV-cured finishes, which have low-VOC emissions. Any of these products should make an attractive, durable floor. To recap, bamboo floors are known for their strength, hardness, abrasion resistance, luster, appearance and structure. Besides its durability and aesthetic appeal, bamboo is also environment-friendly. For these reasons, it makes an excellent choice for your home.